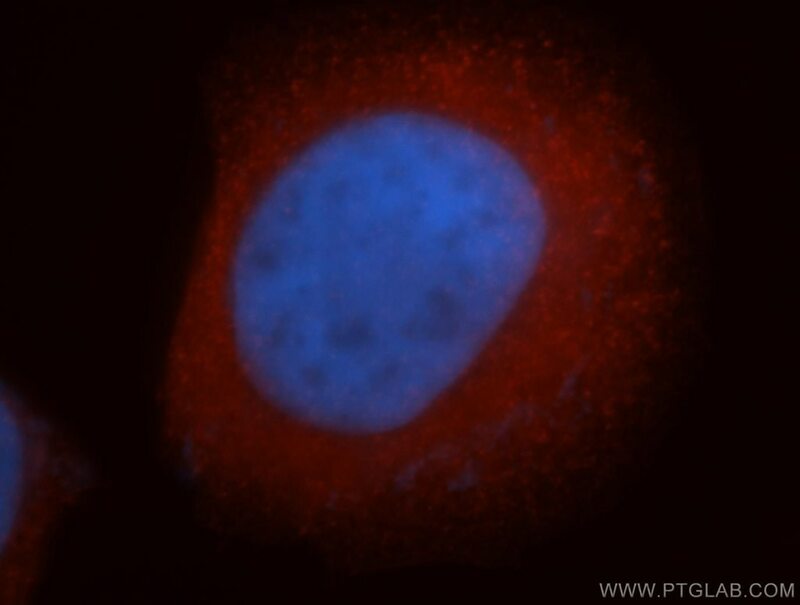 Immunofluorescent analysis of MCF-7 cells, using ISCU antibody 14812-1-AP at 1:50 dilution and Rhodamine-labeled goat anti-rabbit IgG (red). Blue pseudocolor = DAPI (fluorescent DNA dye). IP Result of anti-ISCU (IP:14812-1-AP, 3ug; Detection:14812-1-AP 1:500) with mouse heart tissue lysate 4000ug. 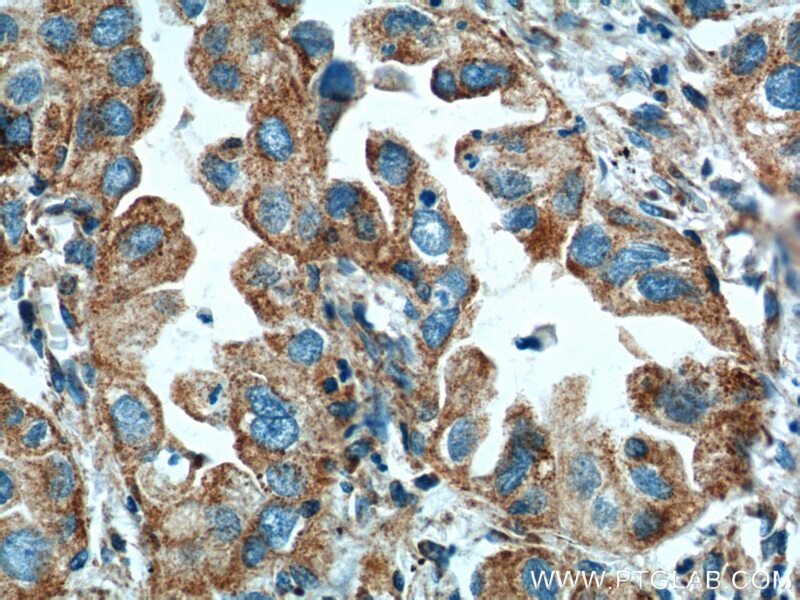 Immunohistochemical analysis of paraffin-embedded human endometrial cancer tissue slide using 14812-1-AP( ISCU Antibody) at dilution of 1:200 (under 10x lens). heat mediated antigen retrieved with Tris-EDTA buffer(pH9). 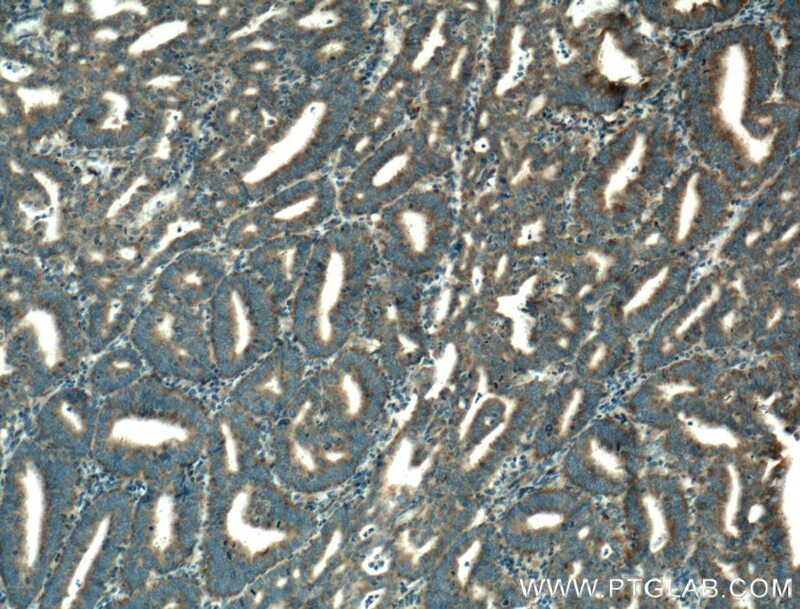 Immunohistochemical analysis of paraffin-embedded human endometrial cancer tissue slide using 14812-1-AP( ISCU Antibody) at dilution of 1:200 (under 40x lens). heat mediated antigen retrieved with Tris-EDTA buffer(pH9). Iron-sulfur (Fe-S) clusters are required for the functions of mitochondrial aconitase, mammalian iron regulatory protein 1, and many other proteins in multiple subcellular compartments. Mitochondrial and cytosolic isoforms of the human Fe-S cluster scaffold protein, iron-sulfur cluster assembly enzyme (ISCU), is involved in activation of iron uptake, redistribution of intracellular iron, and decreased utilization of iron in Fe-S proteins. Defects in ISCU gene are the cause of myopathy with exercise intolerance Swedish type (MEIS), which is characterized by lifelong severe exercise intolerance (PMID: 18304497). Two ISCU isoforms ISCU1 (cytosolic, 15 kDa) and ISCU2 (mitochondrial, 18 kDa), were produced by alternative splicing, and ISCU2 is considered the canonical isoform1. ISCU2 protein is rapidly processed upon maturation (PMID: 11060020). 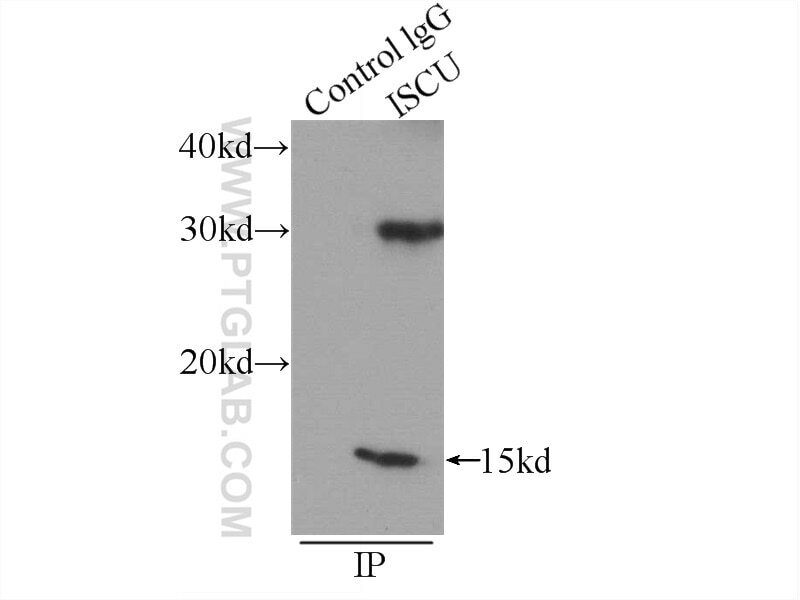 Proteintech’s ISCU antibody 14812-1-AP is raised against the full-length ISCU2 and is expected to detect 14 kDa,15 kDa and 18-19 kDa bands which has been reported in the previous observation (PMID: 11060020). Dysfunction in the mitochondrial Fe-S assembly machinery leads to formation of the chemoresistant truncated VDAC1 isoform without HIF-1α activation. The Diabetes Drug Target MitoNEET Governs a Novel Trafficking Pathway to Rebuild an Fe-S Cluster into Cytosolic Aconitase/Iron Regulatory Protein 1. MicroRNA-210 Downregulates ISCU and Induces Mitochondrial Dysfunction and Neuronal Death in Neonatal Hypoxic-Ischemic Brain Injury. MicroRNA-210 decreases heme levels by targeting ferrochelatase in cardiomyocytes. 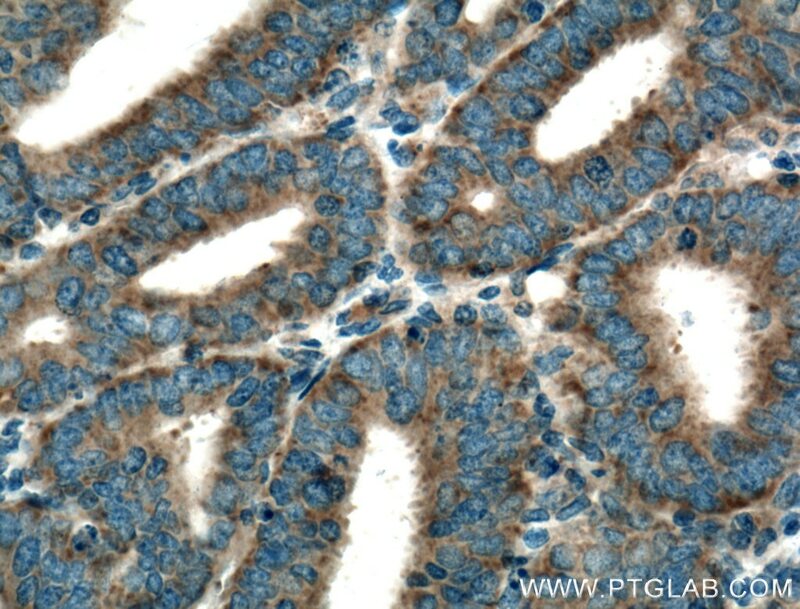 Immunohistochemical analysis of paraffin-embedded human lung cancer tissue slide using 14812-1-AP( ISCU Antibody) at dilution of 1:200 (under 10x lens). 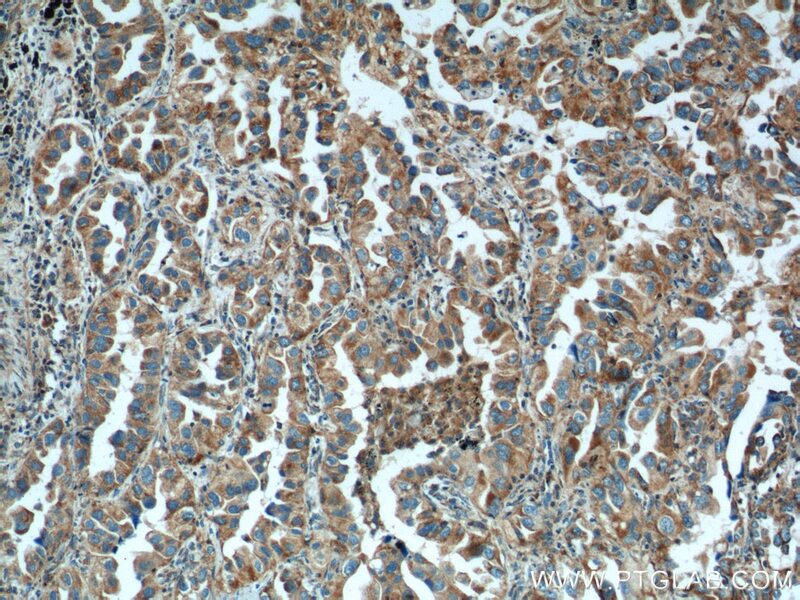 Immunohistochemical analysis of paraffin-embedded human lung cancer tissue slide using 14812-1-AP( ISCU Antibody) at dilution of 1:200 (under 40x lens).